The first true all-range hunting projectile is now available as a component bullet. Unlike other bullets that can fail to perform on impact at lower velocities, Federal Premium® Edge TLR® uses the exclusive Slipstream™ polymer tip to initiate expansion at long range. The patented hollow-core design initiates expansion at velocities 200 fps lower than other polymer tips. At close range, the bullet’s copper shank and bonded lead core retain weight for consistent, lethal penetration. Its long, sleek profile offers an extremely high ballistic coefficient and AccuChannel™ groove technology improves accuracy and minimizes drag. Available in bullet diameters and weights to load the most popular cartridges in long-range hunting. 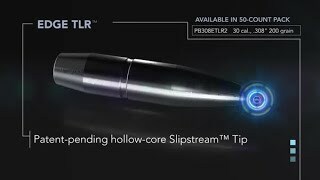 The Edge TLR™ bullet’s sleek boat-tail, secant ogive, Slipstream™ tip and unique AccuChannel™ grooving bring drag to an absolute minimum for the best possible long-range ballistics.